Saline County Sheriff's new unit #959 hit the road recently. It is a Ford® SUV Utility PI. This unit is outfitted with a Thunderstruck® push bumper with a pair of Federal Signal® AS124™ speakers and Rumbler™ up front. With the Federal Signal® Integrity™ multicolor lightbar that includes the flood feature, this unit will be seen when needed and hard to spot when just patrolling. All of the lights and siren are controlled via the Federal Signal® Platinum Smart Siren™. Equiped with the Harris® Unity XG-100M™ full-spectrum mobile they are not only able to communicate with their local personnel on their UHF systems, they are capable of communicating with any agency on the State of Kansas trunk system or any other agency that operates in the VHF frequency band. 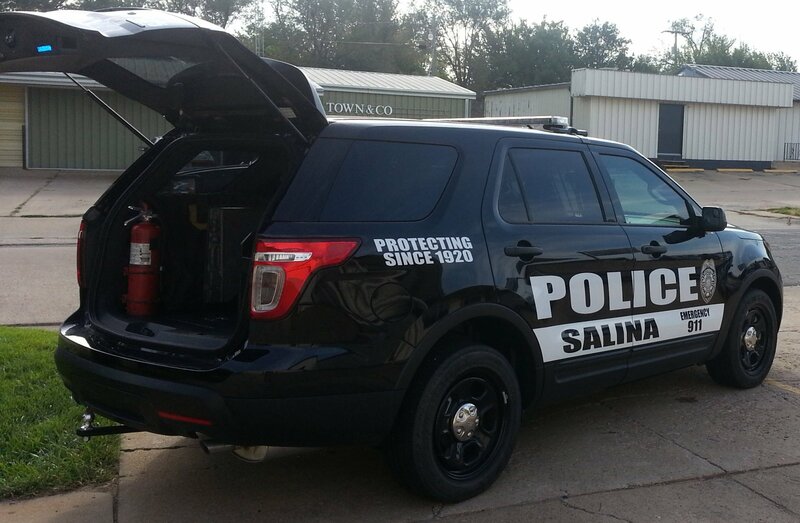 Salina Police Department put into service their new 2014 Ford PI Interceptor Utility vehicles this year. These squads have custom built rear compartment organizers that house all of the electronics along with all of the other tools that the officers care with them. The vehicles are equipped with Federal Signal's Integrity lightbar that incorporates multi-color LED technology.